Published on August 15, 2010 in i love la. 1 Comment Tags: BloggingLA. 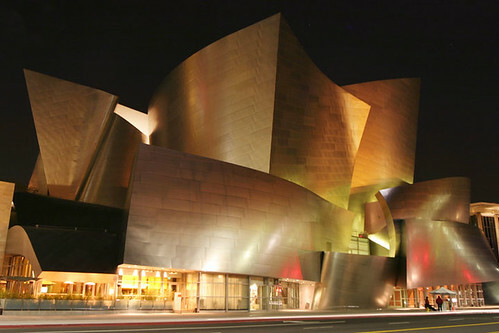 For the uninitiated, the name Walt Disney Concert Hall (WDCH) conjures up images of– well– Disneyland. But even though Lillian Disney made the initial gift of $50 million to the Music Center in dedication to her late husband with additional funding coming from the Disney family, this building is really not Disneyesque at all. Though it bears the name of Disney, many other individual and corporate donors, as well as The County of Los Angeles (which agreed to provide the land and significant additional funding to finance the concert hall’s six-level subterranean parking garage) are credited to bringing LA’s newest landmark (on this particular series, anyway) to life in 2003. 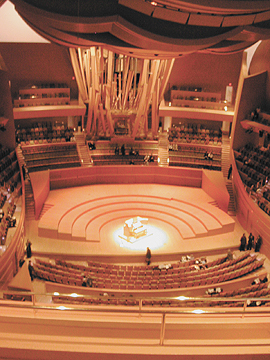 Designed by Los Angeles-based architect Frank Gehry, WDCH is the newest addition to the Music Center and home to the Los Angeles Philharmonic and the Los Angeles Master Chorale. The Roy and Edna Disney CalArts Theatre (REDCAT), which features experimental dance, theater, music, film and visual arts exhibitions, is also located in this complex. There’s no doubt that one of the most controversial parts of the building is the architecture itself. The shiny, metallic curves of the building jut out of the downtown landscape– unmistakably taking a spot as an L.A. landmark since it opened. I admit it– I hated this thing as I watched it being built in the late 1990s. I thought it was horrifically garish and I thought it was hilarious when the reflective qualities of the surface (plus some of the concave sections of the building) turned out to act like a parabolic mirror– causing a “heat ray effect” to the condos nearby and creating hot spots on adjacent sidewalks of as much as 140 degrees (F). 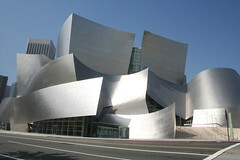 In 2005, the bright glare of WDCH was literally dimmed when the metal panels were sanded down to a more “matte” finish. Maybe I just needed some time for my eyes to adjust to the glare, but admit I no longer see this building as an eyesore. And I’ve even gotten to know it and love it– outside and in. Acoustically speaking, WDHC is amazing. One of the things that won me over was how the architectural elements of the new hall affect its acoustics. First and foremost, this building is a concert hall and the work of the architect, as well as acoustician Yasuhisa Toyota, reflect this. The design of the hall includes a large concert organ, which was completed in 2004 and despite some of our positive and negative experiences with it, there’s no doubt that there’s no other organ which looks like this in the world. The organ is so complex that it took a full year to tune. The debate of whether or not the Walt Disney Concert Hall “fits” the downtown landscape still rages on— but in my mind, there is no doubt that it is a landmark which will come to define Los Angeles– and its arts– for decades to come. Check out the other posts in our L.A.â€™s Great Landmarks series.